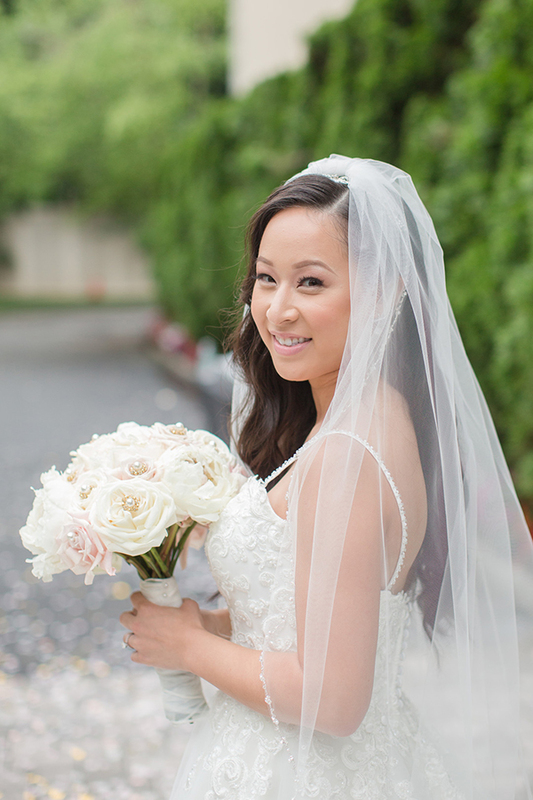 It’s Valentine’s week and what better way to kick off the week of love with a pretty in pink wedding? 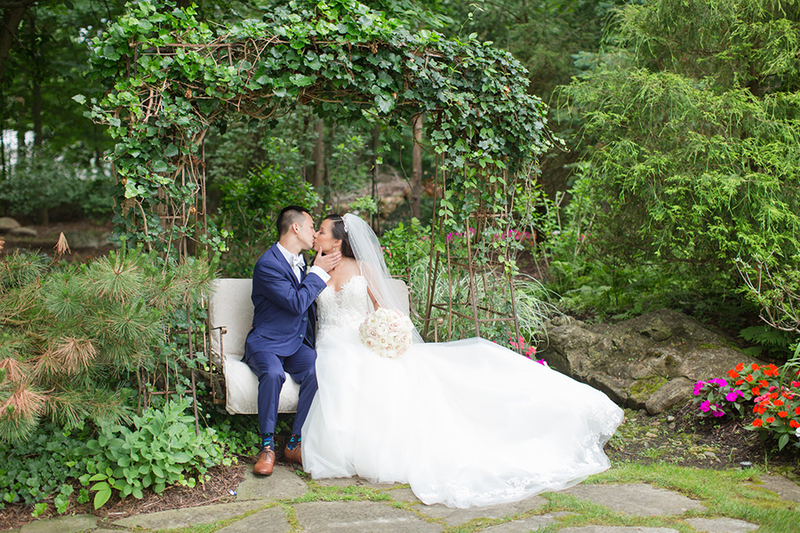 But before we get into the details captured through the lens of Tina Elizabeth Photography, we just have to share this adorable duo’s love story. 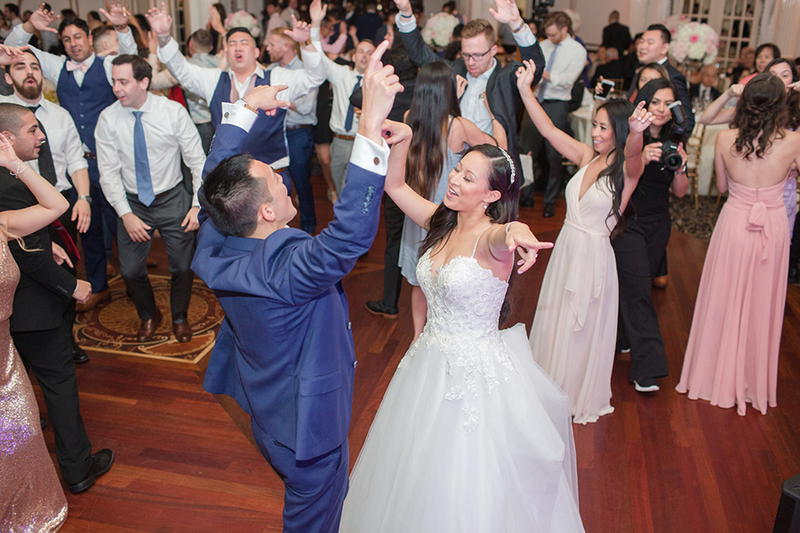 Although the two both attended Rutgers University, it wasn’t until the two were in Punta Cana for spring break when they hit it off during their sorority and fraternity pool party mixer! They began dating the following month and about four years later Kenny proposed as the ball dropped on New Year’s 2017. 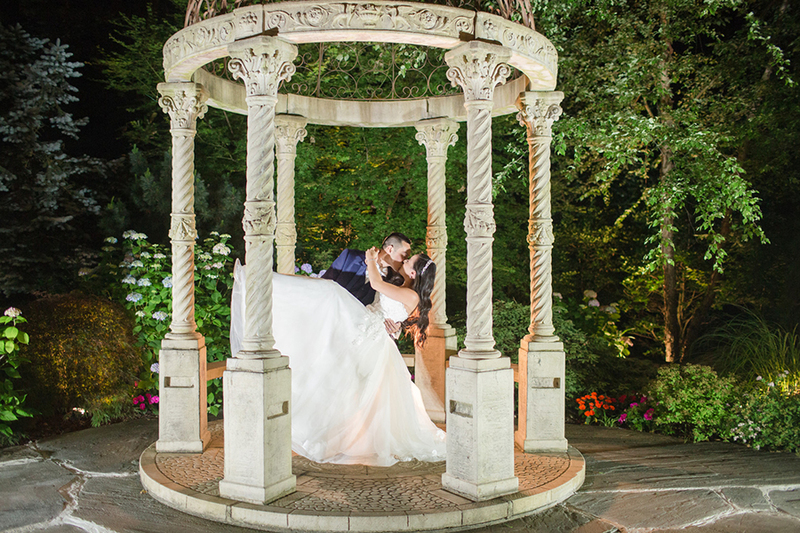 “We were flying back from Cancun for our winter vacation and decided to stay in at my house. My family was there and were in on the surprise. Kenny’s parents came to my house about 10 minutes before the ball dropped to ring in the new year with us. 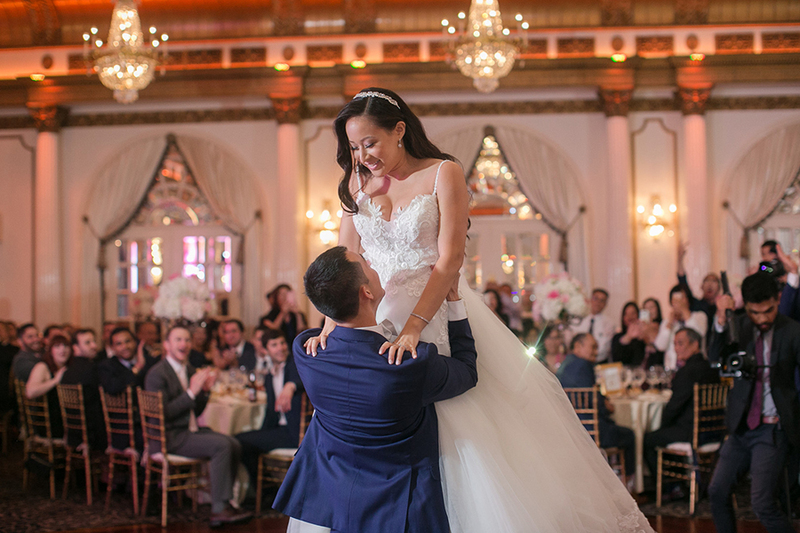 When the ball dropped, I turned around to give Kenny a New Year’s kiss and he was already down on one knee.” As for their wedding day at the Crystal Plaza? 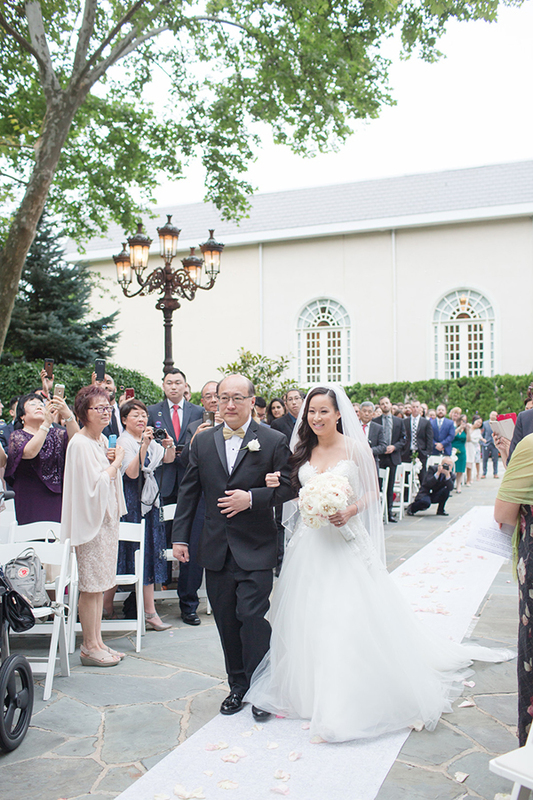 Well, this gallery is filled with so many pretty details including mismatched bridesmaid dresses in shades of pink, a laser cut invitation suite, confetti tosses, balloons, a Chinese tea ceremony paying homage to their heritage, an outdoor ceremony, and a fairytale reception that ends with a sparkler exit. 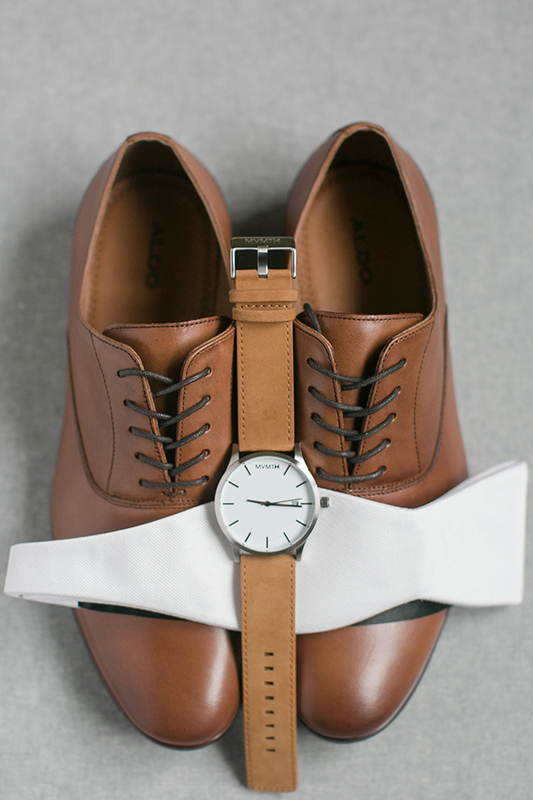 Take a peek below! 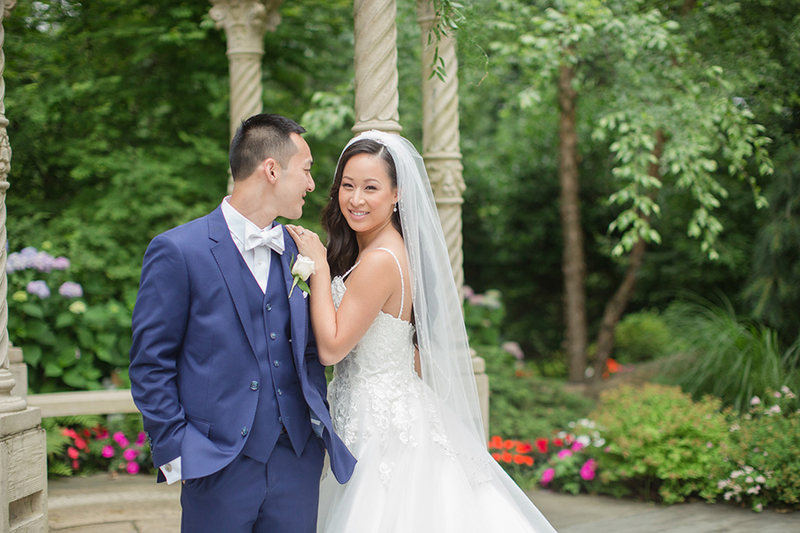 From Tina Elizabeth Photography…Tiffany & Kenny’s wedding day was filled with endless amounts of joy and love! 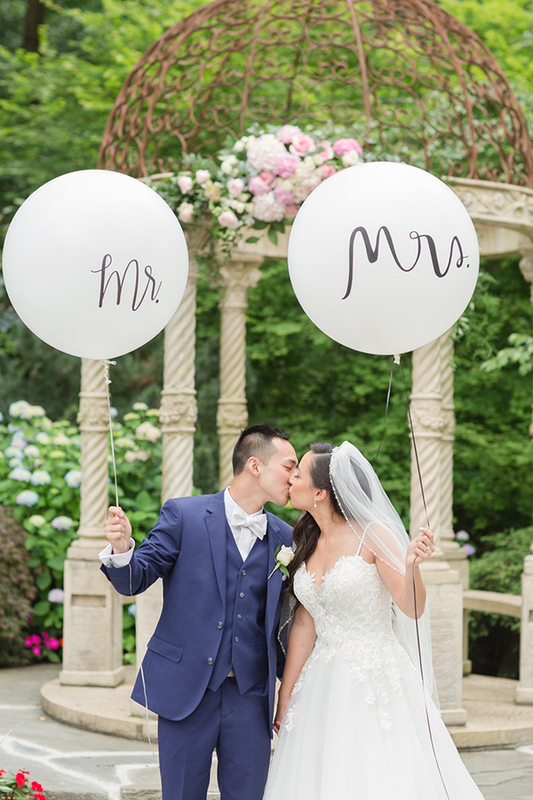 It was also filled with fun balloons, confetti tossing, flowers on top of flowers, a stunning Bridal party, a sweet Chinese tea ceremony with their families and elders, the most delicious smelling pastry bar and nonstop kisses. 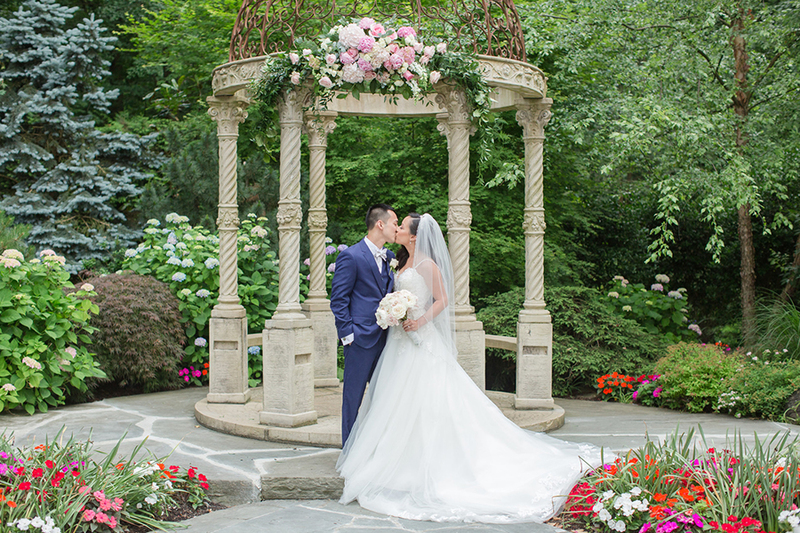 There is so eye candy in this wedding day and so much to love! 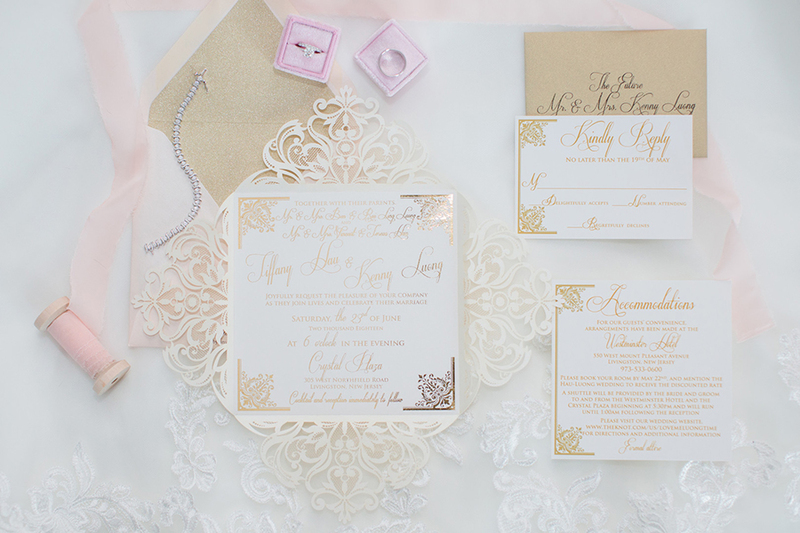 The theme of our wedding was pink, white, and gold. There was also some Kate Spade inspiration with our props. 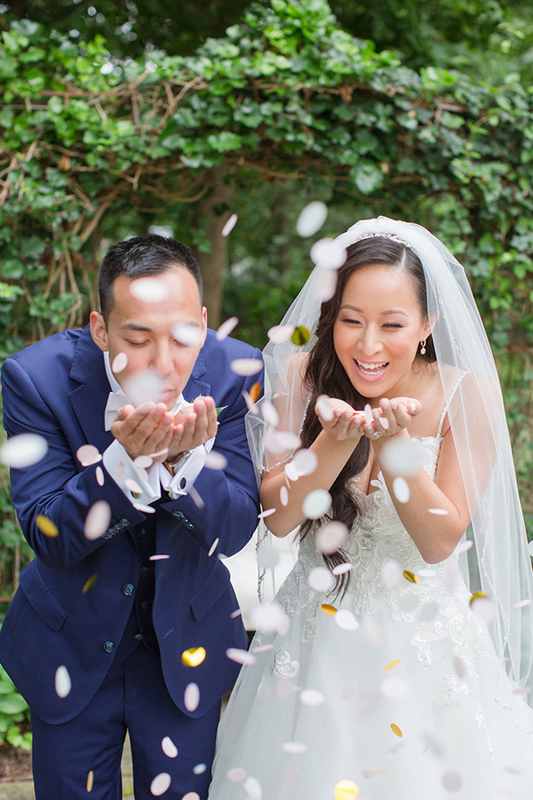 We included pink, white, and gold confetti to throw and blow, as well as Mr. and Mrs. balloons. 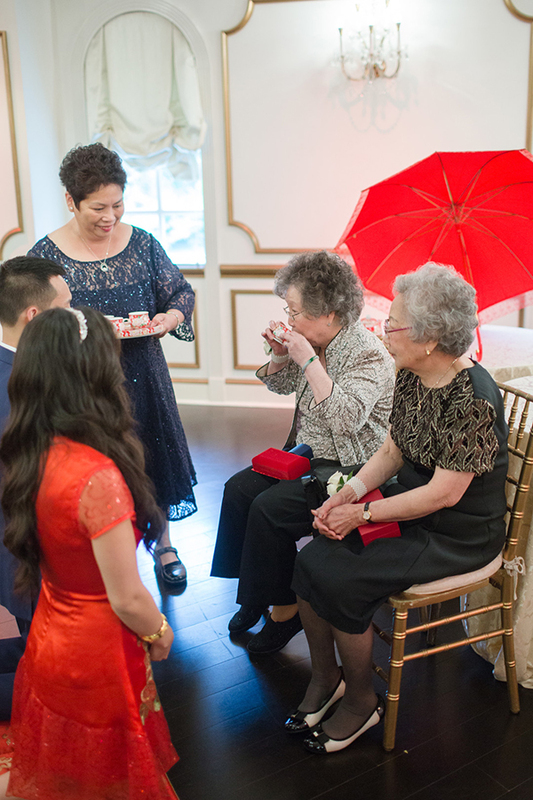 We also had a Chinese Tea Ceremony right before our American ceremony. The colors for the Chinese Tea Ceremony were red and gold. 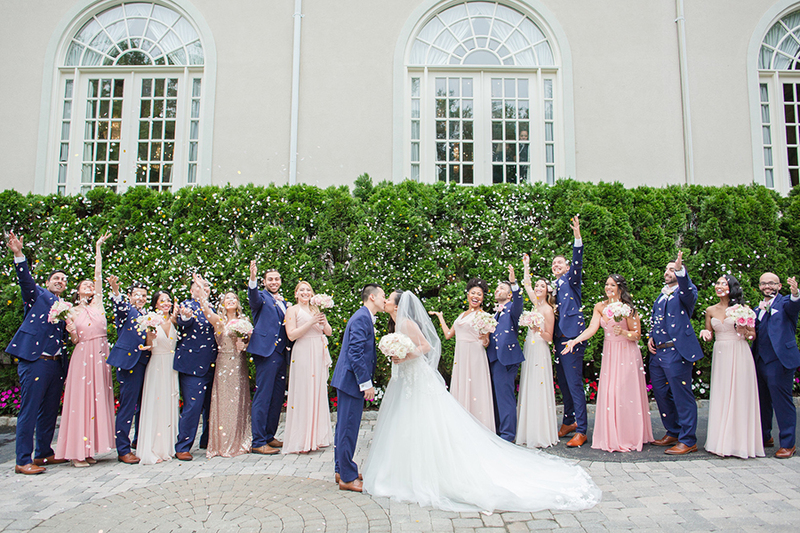 Our groomsmen wore blue suits and our bridesmaids wore 3 different shades of pink. I had 8 bridesmaids and I assigned each a shade of color. My maid of honor wore rose gold sequins. I had three bridesmaids wear blush, two bridesmaids wear petal (lighter pink), and two bridesmaids wear rose (dark pink). I wanted to look like I belonged in a fairy tale. When I tried on my dress, I knew it was the one. It had sequin spaghetti straps with a lace sweetheart neckline. It also had some poofiness to the bottom. The train was long and I had alterations done to add lace on the train that matched the top of my dress. I had a tiara that my sister chose for me. My hairstylist styled my hair so that it had a soft Hollywood wave. The shoes that I wore were from Bellabelle shoes and are white with lace and criss cross straps. My husband wore a blue suit with a white bowtie. 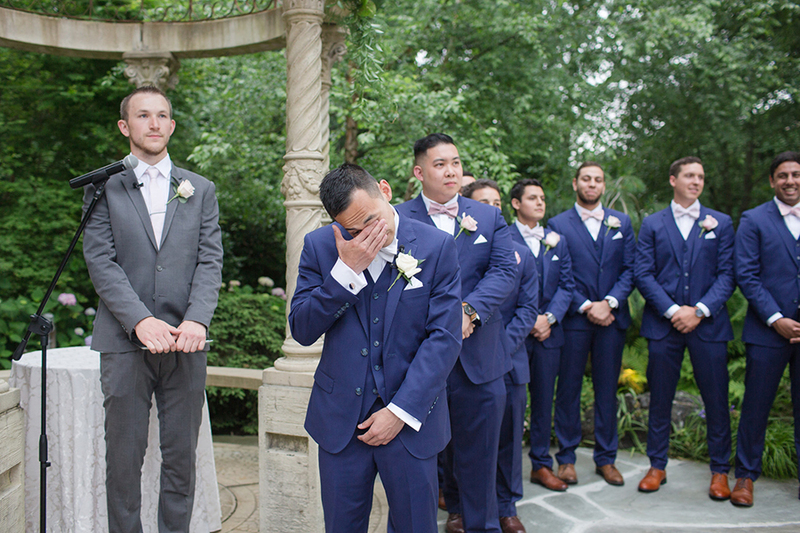 His favorite color is blue so he wanted all of his groomsmen to wear the same shade as well. All of our decorations for the ceremony and reception were either pink, white, and gold. We had gold frames with the table numbers in gold for every table. Each table had different shades of pink and white flowers for a centerpiece that were placed in tall vases. 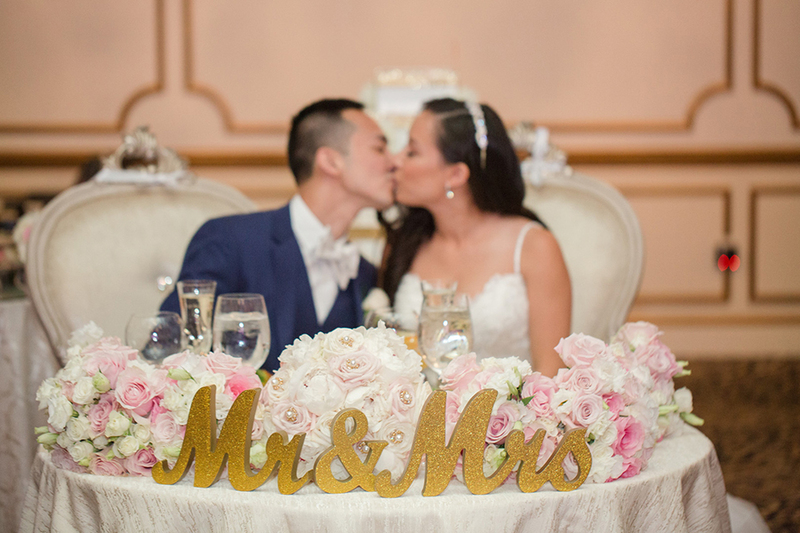 The centerpieces matched the gold chairs in our ballroom. 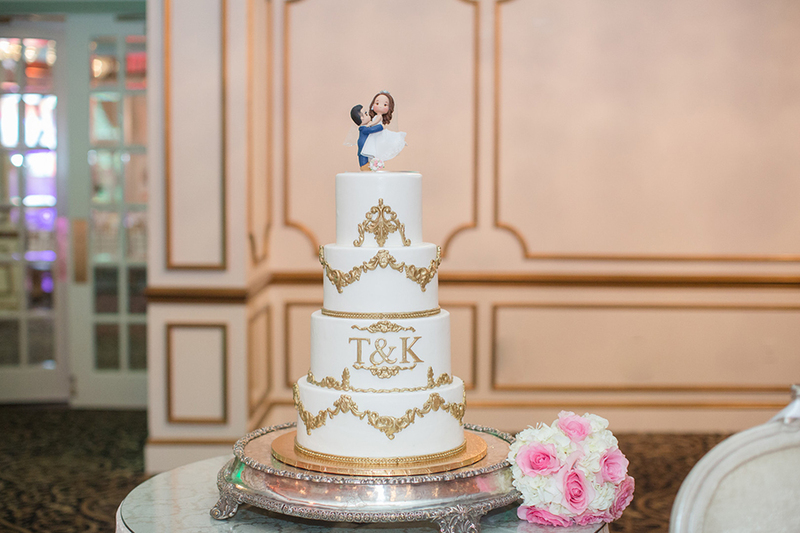 We also had signs behind our chairs that were in gold and said “His Princess” and “Her Prince.” I made our card box which looked like a three tiered cake that had gold design and white flowers. 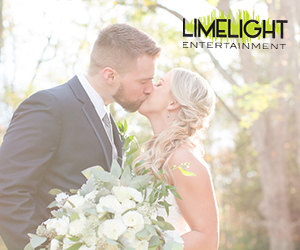 We had a big sign that welcomed guests that was placed at the entrance of the venue. 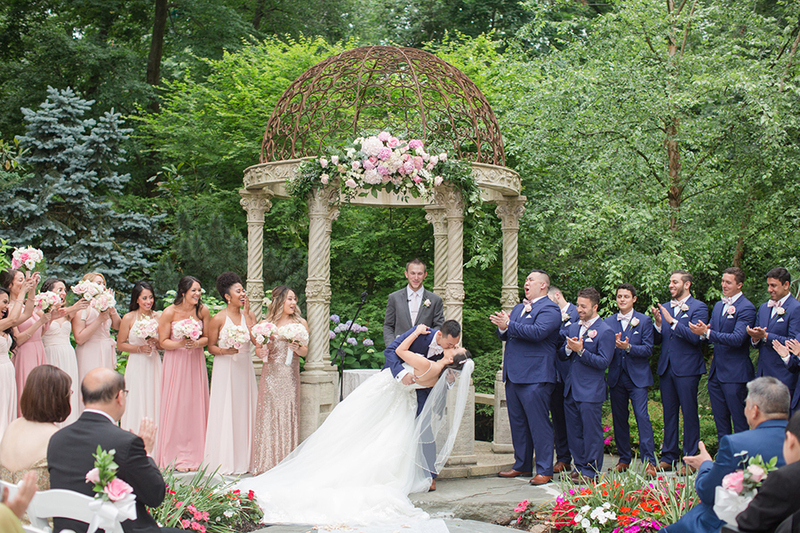 Our florist decorated our ceremony area with pink flowers at the end of every other row, as well as flowers at the gazebo at our alter. 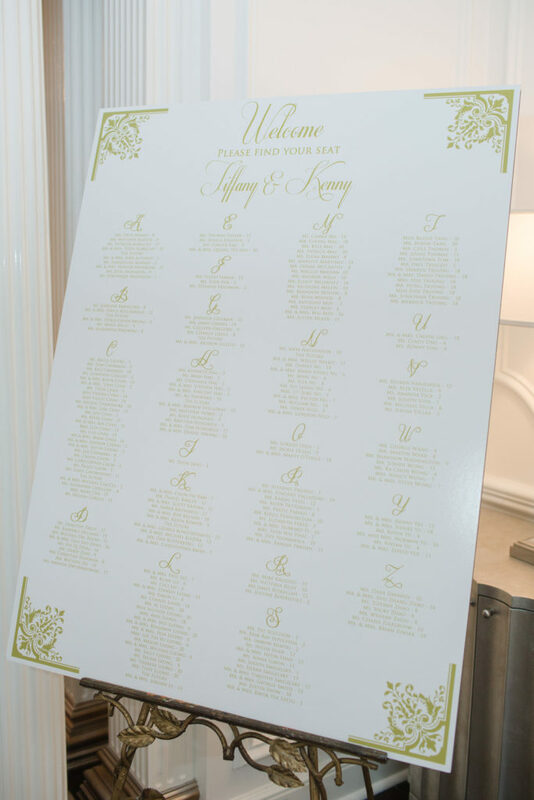 At our sweetheart table, we had gold Mr. and Mrs. letters. The florals were different shades of pink. 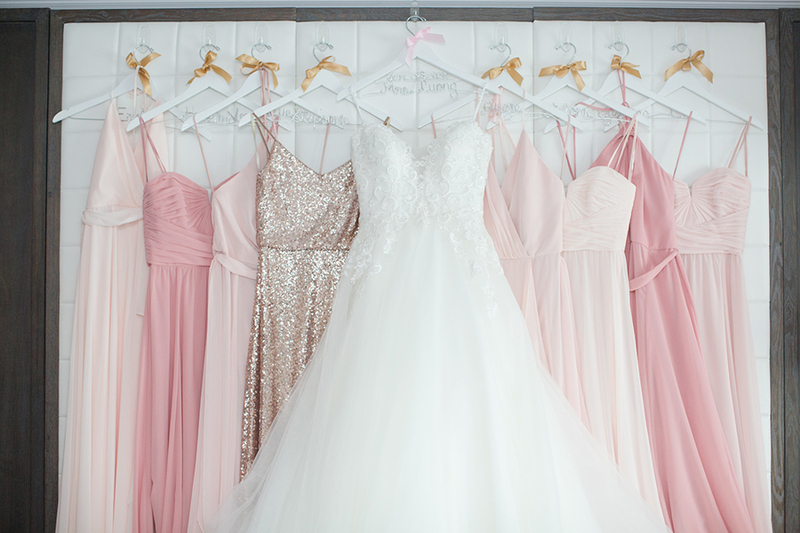 The shades of pink matched each bridesmaid’s dress. 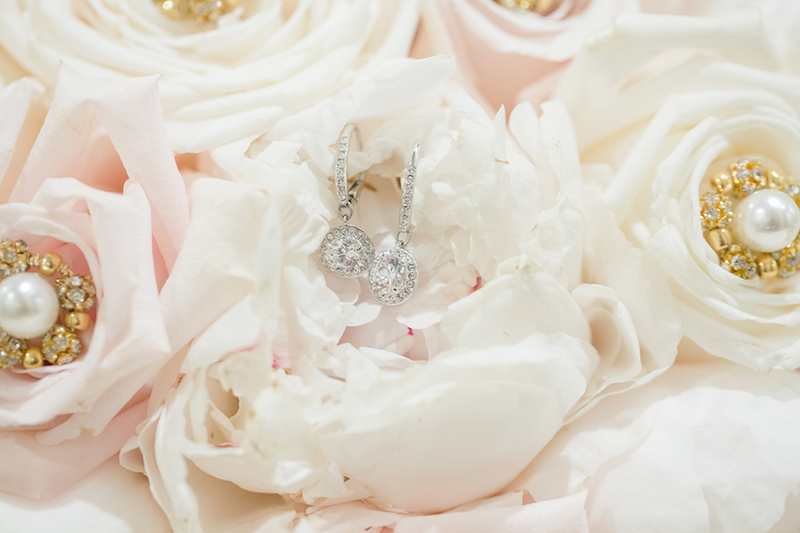 For example, my bridesmaids who wore the light pink dresses had mixes of light pink flowers in their bouquets while my bridesmaids who wore the dark pink dresses had mixes of dark pink flowers. 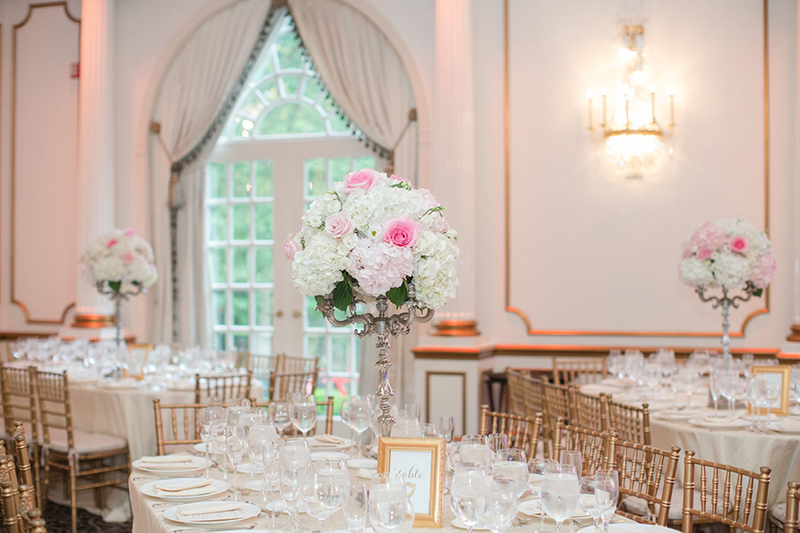 In our ballroom, each table had tall vases of flowers that were white and different shades of pink. 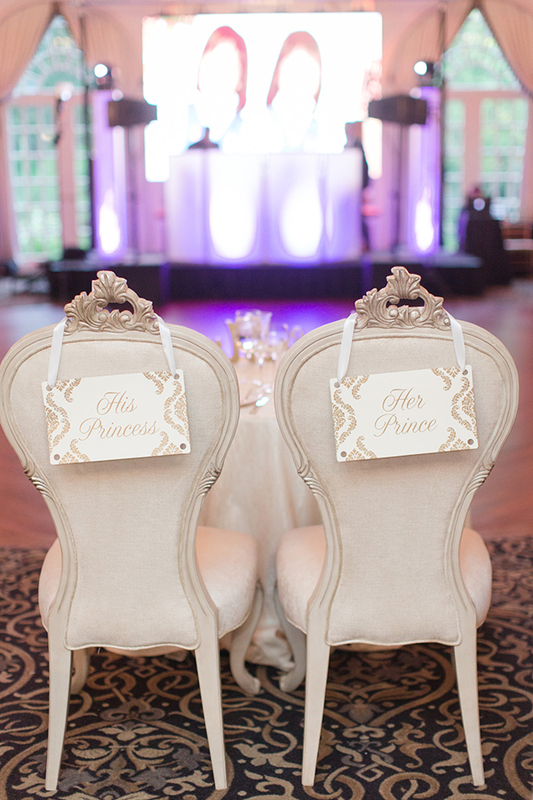 It matched the gold chairs and fit with our pink, white, and gold theme. 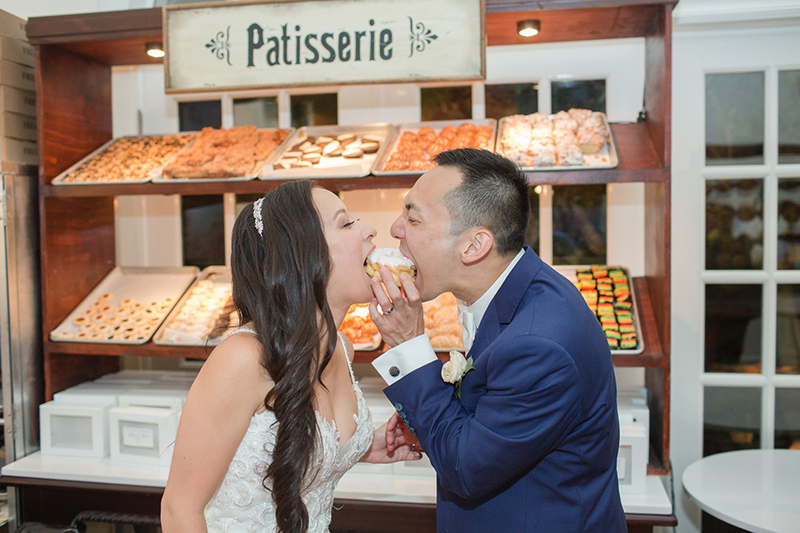 As the wedding favors, each guest was able to bring home a box of baked goods from the bakery that was included at our wedding venue. 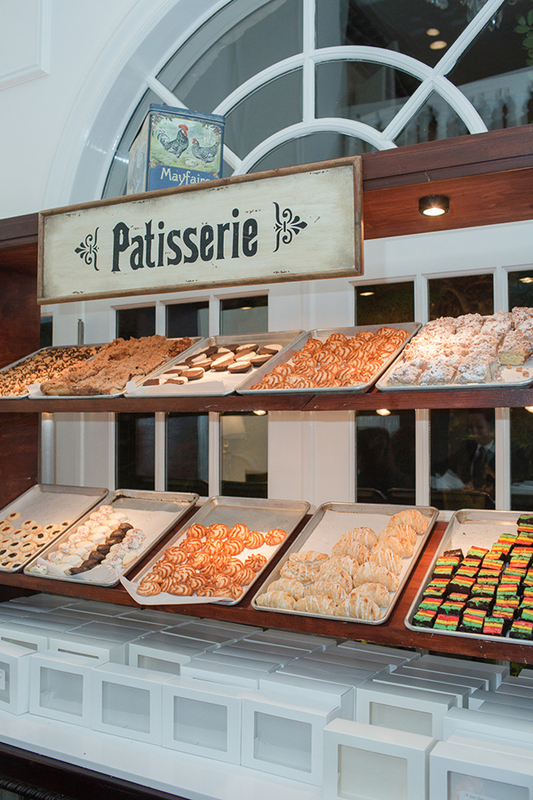 The entrance was transformed into a bakery and guests were able to pick out the different desserts that they wanted. 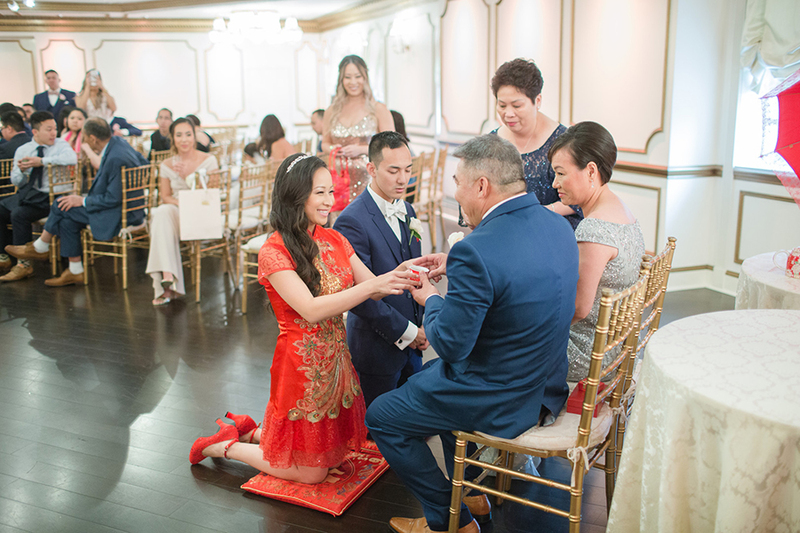 We also had the Chinese Tea Ceremony before our wedding ceremony. 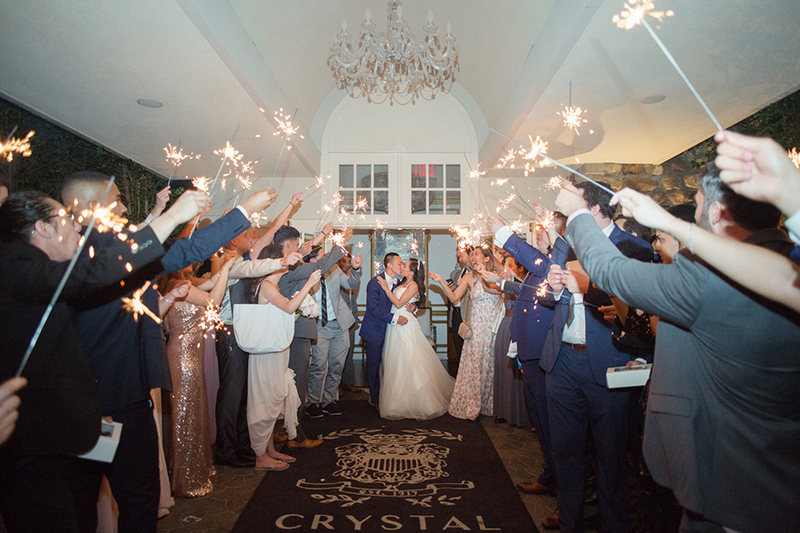 I also enjoyed our sparkler exit.